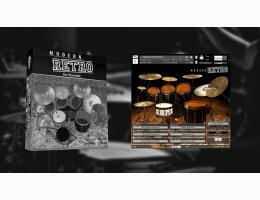 Modern Retro Drums features 4 full drum kits sampled from a 1997 Sonor Designer kit played with sticks and hotords and a Tama Starclassics kit played with stick and brushes. After a through analysis of the best selling singles from the 90s Chocolate Audio realized, contrary to their belief, that the drums featured a rather large room sound, even if sometimes very low in the mix. So they opted for an distinctive room space to recreate that 90s Sound. Another recognizable signature of the music of the '90s is the importance in the mix given to the kick. If the '80s was the epoch of loud snares, the '90s where all about kick sounds, mixed rather up front and with a lot of work on both the "click" and bottom of the kick sound. For this reason, they opted for an extensive use of microphones on the kicks and we prepared the two kicks we had at disposal in no less than 13 different ways. The 6 snares offer a range that goes from a piccolo snare to a detuned and muted snare either using a cloth or various damping materials, resulting in 13 very usable sounds. With 19 Styles and 1119 patterns, the focus for Modern Retro was in delivering a collection of bread & butter grooves and fills fit to the drum sounds. The Styles are freely inspired by some of the most successful singles from the 90s. There is a lot of creativity and variety used to capture the feel of those hit songs, to which they added our production style and the musical taste of a first-rate session drummer. The IR Reverb module in their engine currently features 36 unique proprietary impulse responses. These are derived from vintage plates, hardware and typical rooms, which, when used with drums, push the limits of what can be done with a single drum kit. 25 global mix-ready factory presets help you discover these drum kits, additionally they added different presets for each channel, including the reverb path. Each channel inside the special Kontakt engine can be routed to a separate output, and when properly configured in Kontakt, gives you with the freedom to mix the drums using your own plugins or external outboards.